LINCOLN — I’d be lost without my smartphone and computer, but sometimes I hate them. They connect me, they distract me, they harry me. In “Screens: Virtual Material,” Sarah Montross, associate curator at the deCordova Sculpture Park and Museum, proposes that smartphones are today’s devotional objects. The show is on view through March 18. At first, I rankled at the idea. A contemplative life cannot fairly be likened to a life spent bent over your iPhone. But the line between spiritual pursuits and those of the imagination is porous, and we do treat our phones with devotion. We stroke them and attend to them with constancy. While prayer beads are a spiritual talisman and phones more wide-ranging, both compel sustained engagement with the intangible. Like spirituality, screens plug directly into interior life. Pervasive and captivating, they loom large in our consciousness. They shape us, not the other way around. It’s time, then, to step back and apprehend their power. This incisive exhibition does that, rather in the way modernism upended painting. Viewers who had enjoyed losing themselves in pictures were asked to see abstract paintings as objects. Not everybody was happy. Pictures are absorbing, and the content on our computer screens even more so. Our relationship with whatever we’re looking at is a closed circle we don’t want violated. But Montross does a wonderful job opening space around that circle, so we can blink, take a deep breath, and begin to assess the situation. She places our handy little monitors in a lineage with film, and, further back, with Japanese painted screens and architectural screens in Arabic homes and Christian churches that mediated between two worlds — public and private or profane and sacred — just as digital screens are the scrim between real and virtual. The show begins in the real and solid world, with sculptures. All the work in “Screens” is canny about space and how viewers relate physically — a crucial relationship with the world that devices ignore. The first piece is a knockout: Liza Lou’s “Maximum Security.” More than 6 feet tall, the 23-foot-square, cross-shaped container is fashioned from chain-link fence and densely strung with hundreds of thousands of glass beads. It’s a glittering prison — an object of both desire and confinement, an embodiment of “be careful what you wish for.” Or, if we’re thinking of our devices, a picture of the narrow corridors social media confines us to. Our relationship with our screens is so surface oriented, and the worlds they present so complete, do we ever consider what is behind them? Several artists look inside monitors and imbue their innards with mysterious life. 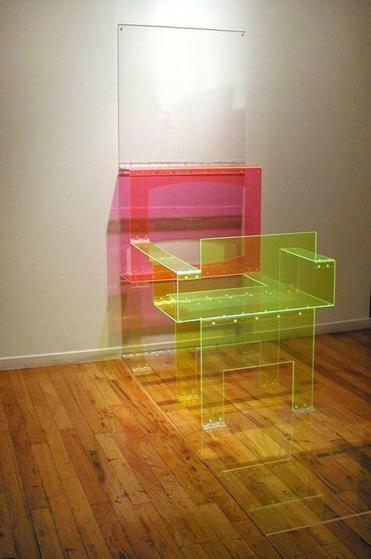 In a series made of television components, Josh Tonsfeldt uses the iridescent LCD prism film as a matrix for assemblage. The pieces have a scrubby, DIY vibe that plays against the magic we expect from TV. Likewise, Penelope Umbrico mixes prism films with photos of broken monitors from eBay and Craigslist in her spooky wall assemblage “Out of Order: Bad Display (100717).” Works by both artists oddly echo the ghostly depictions in 19th-century spiritualist photography. Do new visual technologies summon evocations of the disembodied? The ones that somehow disembody us do. Brian Bress subverts the lush, cinematic world of the monitor in videos at once childishly playful and threatening. Two begin with pretty screen savers. Then performers dressed as puppets cut those away from behind. Bress’s simple conceit — that there’s a hokey children’s show inside your monitor — introduces imaginal space behind the screen. Benign as the puppet people may appear, there’s something sinister about them simply because they’re hidden back there, like the Great and Powerful Oz. To open that space even more, in Matt Saunders’s “Two Worlds, and a Half,” videos of his painted animations project onto, around, and through screens like stretched painting canvases, spilling onto the floor and walls. Boundaries collapse or are permeated; videos swim through the gallery. It’s as if we have stepped inside a three-dimensional screen. That’s a head trip more elaborate than any in the exhibition one flight down, “Cool Medium: Art, Television & Psychedelia, 1960-1980,” a perfect companion to “Screens.” Perhaps more than film, television introduced the idea of the screen as a drug. “Cool Medium” ties the rise of color television to the use of hallucinogens. The show focuses on paintings, including pulsating Op Art works by artists such as Paul Laffoley, Hannes Beckmann, and Terri Priest. Priest’s “Static Variations — Blue Memory,” with its electric blue rectangle floating amid black and white stripes, even looks like a TV. Stephen Beck’s shimmery video animations from the 1970s, made for KQED in San Francisco, recall similar experiments at WGBH. They’re rudimentary compared with video art in “Screens.” But the connection “Cool Medium” draws between the hypnotic experience of watching a monitor and the internal phantasm induced by psychedelic drugs — and, in Laffoley’s painting, mysticism — feeds right into the show upstairs. Marta Chilindron’s “TV and Chair” sits at the threshold between the two exhibitions. It’s made of translucent, DayGlo pink and yellow acrylic sheets, hinged so it can fold up flat as your TV. Opened, the chair sits snug in front of the screen. It’s a picture of how tuned in (and tuned out) we are, and of how isolating screens can be. Our devices are glimmer-glass bubbles we mostly accept without question. To begin to look at them critically, as these shows do, is liberating.